I am Leo, SEO & Marketing Enthusiast. Founder of @SEOCentury. Love Lions, Ford Mustang 1961 & Heavy Metal music. I mainly blog about SEO, Social Media & Technology news. 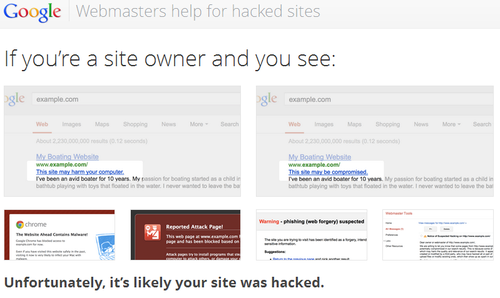 Google has launched a site for webmasters whose sites have been hacked, something that the company says happens thousands of times every day and according to surveys more than 26% of the hacked sites remained compromised. ‘Help for Hacked Sites’ – The series includes over a dozen articles and 80+ minutes of informational videos – from the basics of what it means for a site to be hacked to diagnosing specific malware infection types. The help site covers different types and ways websites can be compromised, provides information on how and why it might have been done and how to recover from the hack. I think it is another great initiative of Google as every day cybercriminals compromise thousands of websites and a lot of them remain compromised.